"Praise and worship" has become popular over the last few decades, but what’s God’s perspective on it? 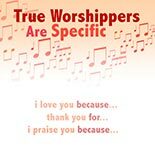 True worship is specific and purposeful. Who are we worshipping and why? Let’s tell Him!